Two years, and (still) loving it! About author – Sarvesh Agrawal is the founder of Internshala. 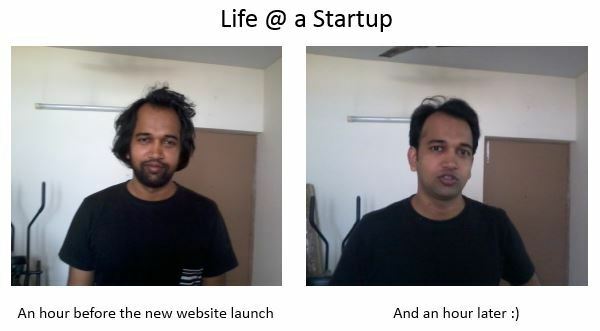 In this article, he writes about his entrepreneurship journey of 2 years. 20th October marked 2 years since I quit my job and took to Internshala as a full time gig. This also happens to be the longest ever professional stint for me – earlier three lasted 18 months each. How do I feel? At peace. When in a job, I was always worried that gradually, like 99% others, I will also become part of the mad race – get good education, a good job (great if you work abroad), a car, a family, a house, few EMIs, then a bigger car, a bigger house, and even bigger EMIs and then boom! You die. Leaving no legacy, no imprint whatsoever. While at a spiritual level, being an entrepreneur also does not answer existential questions of life (What is the purpose? What is the point? etc.) – in Grand Scheme of Things, I don’t think it would have mattered if I had not built Internshala (someone else would have). But at a selfish level, it allows you to confront your inner strengths and weaknesses in a way that feels as if you are living life to the fullest. 3. Learned about Digital Marketing, Customer Service, Accounting & Banking, Law, Design, UI & UX, Video Making, T-shirt printing, setting up WordPress & its plug-ins, Event Management, Hacking & Website Security, and Press and Media relations. 4. Convinced a bunch of people smarter than me to work for Internshala or put money into it. 1. You will be free – Not just creative freedom but physical freedom too. Whenever we old friends meet up, my wife tells me that I look the happiest among the lot and I think it’s true.Despite having great jobs at great companies with great bosses, there were still silly things that gave me lot of stress like need to look professional all the time, using a prescribed presentation template only, having to tolerate plain idiots or political gurus as colleagues, or having to fake sickness for leave when I did not feel like working. Not anymore. I wear round neck t-shirts to work and shave once a week and feel really happy about this little freedom that I have earned for myself. I have also taken more holidays in last 2 years than 5 years of corporate life. There is a strange addiction to a life like this – you feel like a scientist or an academician in a business environment. 2. You will learn to push boundaries of possible – and learn that there are no boundaries (except for the ones created by your own mind). As humans, we derive happiness in overcoming a challenge and a start up gives you ample opportunities for that. I have learned that pretty much everything is possible if I am willing to work incredibly hard over a long period of time. To be able to tap into this infinite reservoir of energy that is with in us is very surreal. 3. You will learn to take decisions – fast and accept responsibility for outcomes. Right from deciding color and size of the visiting cards, to extending $50,000 credit line to a new customer – you will have to make hundreds of decisions everyday with no luxury of analysis paralysis. Decisions, which you could have never got the opportunity or the authority to make in a Corporate career, or which perhaps were not so time/life critical. You learn to be the (proverbial) man! A meeting with myself at Internshala! JJ, you never mentioned above that you also learned to write. Good going buddy! Congratulations man on the success so far and loads of good luck for the future successes. Internshala is still one of my top recommendations when people ask for any. Thanks Aniket – that is pretty heartening to hear! Please check my 3 post just has been declined with no reason. I am not certain what could be the reason for declining your intern requirements. I’d forward your concern to our employer relations manager. Could you please drop an email to employer@internshala.com so that we can get in touch with you?